Snowmobile Crash North of Bridger Bowl Sends one Man to the Hospital. 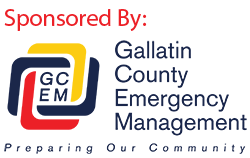 (Bozeman) – Sheriff’s Search and Rescue workers were called to the Brackett Creek trailhead a little after 12:00 this afternoon following a report of a 63 year old male involved in a snowmobile crash. According to Sheriff’s Deputy and Incident Commander Matt Boxmeyer, a 63 year old male from Belgrade was riding with a party of five other snowmobilers, failed to negotiate a switchback curve on Brackett Creed Road. The rider and his machine came off the road and crashed approximately 15 to 20 feet downhill on a rock slide in timber, sustaining face and head injuries. 23 Search and Rescue volunteers 2 Deputies and a US Forest Service law enforcment officer responded to the scene. The patient was stablized at the crash site, placed on backboard and brought up to the road. He was then taken approximately 2 miles by Search and Rescue to the trailhead and transported to Bozeman Deaconess Hospital by AMR. · Always ride under control, and avoid excess speed. · Be aware of the terrain you are riding in and be ready for that terrain to change. · Be sure you are wearing all of your personal protective gear properly.